Last week I had off from work for our “midwinter” break. It wasn’t a very relaxing week but cooking, for me, is very relaxing. Five hours of cooking can actually be quite relaxing as well. And that’s what happened when I decided to take on the challenge that Joan of Foodalogue put in front of her readers – create a dish from Ethiopia. I made six Ethiopian dishes and ingredients and, yes, it took me five hours to create all of it. But, in the end it was all worth it. 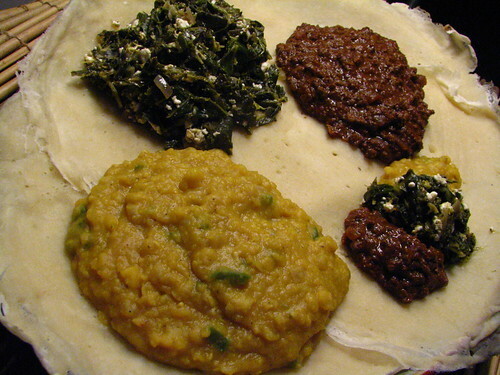 Ethiopian cuisine is one that I have only recently become acquainted with and when I first tasted it, I was hooked. While researching for this post I realized how little is out there on this fabulous cuisine. Anthonly Bourdain recently said that he believed Ethiopian food would be the next big trend in eating and I have to agree that it should be. It’s delicious, communal, flavorful, fun to eat and relatively healthy (except the ridiculously high amount of butter used in the dishes). We’ll see if his prediction is correct. I mean how can you go wrong when all you have to eat with is your hands and some deliciously sour, sponge and crepe-like bread called injera? The two biggest staples of Ethiopian food are a spice mixture called berbere and a spiced clarified butter called niter kibbeh (see both recipe below). Many Ethiopian recipes utilize one or both of these ingredients. 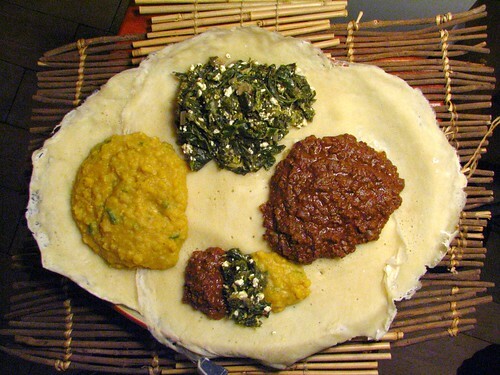 The other staple and accompaniment to Ethiopian food is injera bread which is traditionally made from a specific type of flour called teff and usually takes three days in order for it to ferment causing its sour taste. I didn’t have teff flour so I utilized Saveur magazine’s recipe which wasn’t as delicious as the authentic type but did the trick. Brushing lemon on the bread gave it a bit of the sour flavor I was craving. As mentioned earlier, injera bread is used as your plate, fork, knife and spoon when eating Ethiopian food. Your food will come in small piles scattered on a a big injera where you will tear off bits of the outside layer in order to get the food in your mouth. You continue until you eventually have to eat the layer that has sopped up all the flavors of each dish you chose. These are some of the best bits but you’ve got to get to the end of the meal to savor them. Ethiopian food is like no other – it borrows ingredients from Portugal (chile peppers), the Orient (ginger) and India (spices) to create a taste that is very, well, Ethiopian and very different to anything you’ve ever eaten. Most of the recipes found below are based on things found in the cookbook Exotic Ethiopian Cooking and a blend of other website recipes I found. I recommend you all give Ethiopian a try, whether you have five hours to cook or have always been curious to try that Ethiopian restaurant down the street. Vegetarians and non-pork eaters will have a field day and even the pickiest of eaters will enjoy this fun and fabulous cuisine. So thank you, Joan, for pushing me to finally create Ethiopian food at home. Now that I’ve done it I’ll be doing it again. Now, I hope you will try your hand at it! **Grind chiles in a spice grinder. Toast all seeds for about 3 minutes, allow to cool and add everything to spice grinder and blitz. Melt butter on low heat and skim off the foamy, white layer that that floats to the top as butter melts (this is how you make clarified butter). Add onion, garlic, ginger and spices and allow to cook on low heat for 15 minutes. Turn heat off and allow to rest for 5 minutes. 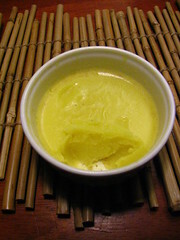 Strain the butter mixture using a fine sieve or cheesecloth and store in a cool place. Bring soaked split peas to a boil and then lower to simmer for 30 minutes. Drain if there is extra water and then mash well (they will be very soft and will mash easily with a fork). Add butter to another pan and stir fry onion and garlic for a few minutes till onion is translucent. Add ginger and spices and give a quick stir. Add back the mashed split peas, jalapenos, salt and pepper and a cup of water (or veggie stock). Reduce for a few minutes until you have a thick puree. Serve on or with injera. 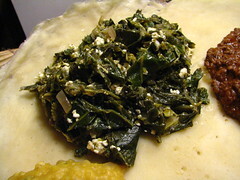 Boil greens until tender. Drain and press down to get rid of all the excess water. Finely chop greens. Add butter to a pan and cook onions for five minutes then add ginger and garlic and cook for a minute or two. Add greens and stir. If you find it needs a bit of moisture, add a touch of water or stock. Add salt and pepper to taste. Transfer to a bowl and stir in drained cottage cheese. Fry onions for a few minutes and add garlic and ginger. Add berbere plus water, stir. Add nitir kibbeh and sprinkle beef while stirring. Allow all the beef to cook and all the liquid to be cooked away. Add rest of spices, stir. 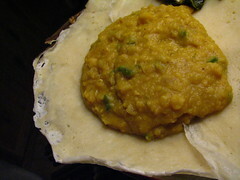 Allow to cook until meat is done, about 15 to 20 minutes. 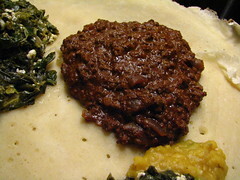 Serve on or with injera. You deserve much respect for making that yourself. During my second stint as a student I lived in a flat which had several Ethiopian or Erithraen restaurants close by. I’d be happy enough making the meat and vegetable stews but I didn’t think I’d get injera right and that was one of the things I loved best. All the juices from the other dishes soaking into it. Gorgeous! @Ros: injera was definitely the hardest thing to make in this post. We didn’t get it exactly right either. More practice needed!